So the Prime Minister of the United Kingdom has been found holding back, and people have foolishly assumed she has no cards of value in her hand. Criticism from left and right has been piled on her for NOT giving away her intentions … and thankfully she has resisted the temptation, nay, the manipulative bullying, to do so. Well done her, for she knows that ‘Time Discovers Truth’ as Seneca observed – and it is doing just that. How different are today’s commentaries than those of just six months ago! Even the BBC is subtly shifting its approach. The bullying EU presidents are becoming more conciliatory as they get over their pride and have to face the power of democracy. The mandarins are slowly changing their minds (and their jobs), relearning the meaning of the two words ‘Civil’ and ‘Servant’. The economists are now making excuses for the (terrorising) forecasts they declared. And the europhile politicians are realising that the horse they were flogging is now beyond resuscitation. A sensible realisation in the light of the arrival of far more useful means of transport. Except a few like Blair and Clegg who, for whatever reason, are finding change personally difficult. They are paying a high price in terms of lost credibility, though still raking in their millions I notice, Mr Socialist Blair. It has been good for us to wait these last six months. Yes, I personally longed for Article 50 to be invoked immediately in July, but I can now see the wisdom of not doing so. I’m a naturally impatient person, but I know the very world we want to do business with post-Brexit is watching, and we need to be – and be seen as – trustworthy, law-abiding and thorough. The prize, I think, will be worth the wait. 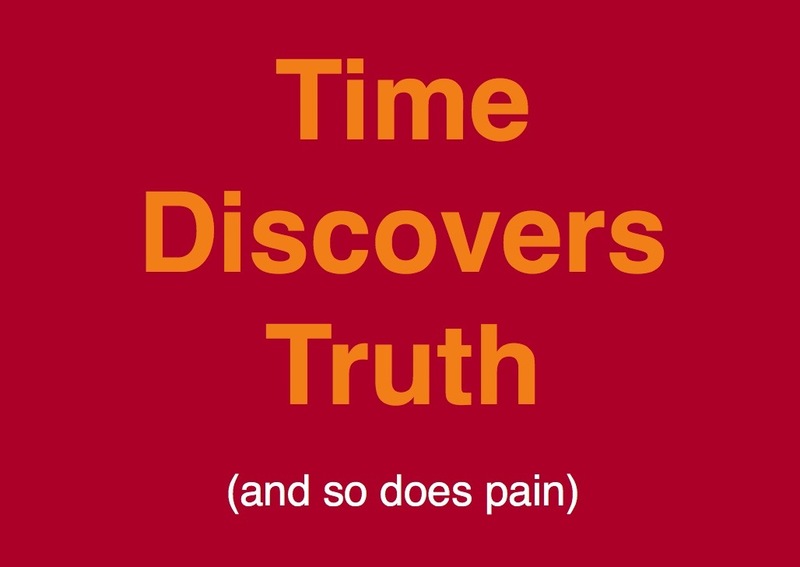 Time discovers truth in my coaching practice too. It may take years of discomfort for a potential client to finally accept that they cannot blank things out for ever, or fix things on their own. The cracks get wider, the unhappiness can no longer be shouted down. Truth will out. Time and again, that’s when the call comes – “Andrew, I think I need to come and see you” – and for my part, waiting for that moment makes working with that client so much more successful. The inner protests, the denials, the confusion, the medication, the disappointment are now revealed as what they are: cover-ups, painkillers. The need to discover – or accept – the truth overtakes the embarrassment of having a need that cannot be satisfied by short-term, shallow fixes, or toughing it out. The painkillers are no longer working. Thankfully there comes a time when the waiting is over, when the truth has become evident, when the cracks no longer respond to Polyfilla or being papered over. We’re beginning to see that in the EU as outgoing president Martin Schulz said today that the EU is “hamstrung”. If you feel like that here at the beginning of 2017 (or know someone close to you who is) it may be time to do something about it. Here’s the number 0777 163 1945 or email me at andrew@powerchange.com. Another reason for voting Leave: Big isn’t Better. In today’s world it is not size but flexibility that matters. Big does not equal better. The greatest success stories in the animal kingdom are not huge elephants and rhinos, but ants. Billions and billions of them, in multiple self-sustaining colonies, underground, chattering away, getting on with the work of looking after each other and forming what is now believed to be a global network. Today’s most successful wars are not won with nuclear bombs. They are won with IEDs, Kalashnikovs, an empowering vision, and inspiring words. Small things. Lots and lots of them. Big things are vulnerable and are easily crippled. “A bee can bite the bottom of the Pope in Rome” (Les Miserables”). An easy target. Billions of small things are difficult to get rid of, as anyone who has had an infection knows only too well. So how does this reflect on the Brexit campaign? In this world of exploding chaos and complexity, where centralised decision-making cripples progress, the world’s key decision-makers are those at the edge, ‘little people’ facing the immediate local situation who can switch twice in a day, adjusting to what they find. And the best leaders are those who understand that principle, training those people, educating them, inspiring them … and then giving leadership-power away to them, empowering them to decide ‘there and then’ at the point of need, equipped with the knowledge they need. It is immediate connectivity and flexibility that are key in this context. The delivery driver on his mobile phone in his little white van phoning the customer, the school teacher in the classroom dealing immediately with the behaviour of a student, the bobby on the beat sorting an argument, the child deciding on what to have for breakfast. Think ant not articulated truck. When faced with a challenge, ants get into a little community group and sort out the problem, attacking, defending, and even dying when necessary. (They are typically called ‘worker’ ants. I like that!) When the problem is solved, they go back to their work until needed again. They will go to incredible lengths to support each other, sacrifice, and work. The one in this pic is carrying a seed many times its weight and size. And it all happens in seconds and minutes, not months and years. Quick, efficient, local decision-making by those affected by the decision sorting the problem out together. Collaboratively. Without a formal structure. So the predictions for the EU are speculated upon for the next 15 years. “It will be like this in 2030.” One thing is sure. Every prediction will be wrong, whoever makes it. Remember 15 years ago? It was the everyday people, filled with vision and purpose, who decided that for them there was no box to think out of. Like the bumble bee that is technically unable to fly because of it’s weight and wing area, they just get on and do it. When I see the EU voting for the development of smaller government, disbanding important parts of itself (especially those that currently meddle uninvited in the detail of human community), distributing decision-making power to the edge, promoting freedom, encouraging diversity and speed by building connectivity (roads, airports, internet access), maybe it will get my vote. I’m not holding my breath. Today it seems to me to be more of a big overloaded truck stuck in a narrow lane, shouting at us about how we cannot do without it because it’s going places, yet blocking the way for the farmer, mother and deliveryman queued up behind, trying to get on with real life. Meanwhile the flexible little ants quietly march past, over, under and round it, vote it off the job and get on with the work of living. Those who want the EU are welcome to it. I’m voting ‘ant’.